One of the most common misconceptions about UFOs is that the phenomenon is the United States of America is alone in receiving visitors from outer space. This simply isn't true. While the U.S holds the top spot on the list of countries most visited by aliens, the phenomenon occurs world wide and the American South West is only one of a number of UFO hotspots worldwide. The area surrounding the Amazon rainforest (Brazil in particular) is another such hotspot and this is also where some of the worlds most incredible UFO stories are born. In August 1970, Almiro Martins de Freitas was working as a security guard for the Funil Dam in Itatiaia, Brazil. Patrolling the area he encountered a hump-shaped object with a row of flashing red and orange lights sitting atop a small hill. As de Freitas approached the object it began to make a 'terrible noise', so loud that it scared the bejesus out of him. Scared, de Fretas' first instinct was to draw his revolver and take a shot at the strange object, invoking a defensive response; a bright red flash blinded the gun toting security guard and he felt a simultaneous wave of intense heat. This apparently rendered de Freitas immobile. A colleague found him frozen to the spot waving his gun in the air and shouting “don't look at the light!” By this point, however, the object has disappeared leaving no trace. De Freitas was taken to a nearby hospital where he was submitted to a battery of physical and psychological tests, all of which confirmed that he was fine. Both the paralysis and loss of sight he suffered were attributed to shock. Chile's Valle de Elqui is a hotbed of paranormal activity. Not only is this remote valley a UFO hotspot, it's also the location of a Roswell-type UFO crash and government cover-up. Early in the evening of October 7, 1998 residents of Paihuano, a small village in Valle de Elqui, spotted a strange object hovering over a nearby hill. The object was described as being metallic, elongated and about 15 metres across. Its reflective surface and its position overlooking the village ensured that it was noticed by almost everybody in the vicinity. As the baffled villages stared in amazement the object began to increase its altitude and turned as if to leave. But something seems to have gone very wrong aboard the UFO; instead of flying off into the unknown it broke in two, scattering wreckage across the hilltop. A detachment of Carabineros (Chilean militarized police) quickly arrived on the scene. They made several attempts to reach the remote crash site on horse-back, eventually returning with absolutely nothing to report. They claimed to have found nothing of interest but proceeded to call in the military and cordon off the area. Over the next few days the area around Paihuano was a hive of activity, with military vehicles coming and going at all hours. A goatherd working in the area claims to have seen unmarked helicopters attempting to hoist a large metallic object into the air using nets. Later, large tire-prints were seen leading out of the area, leading UFO researchers to conclude that something very heavy had been taken away by truck. Did the Chilean government retrieve the crashed UFO? It certainly looks that way. Perhaps the most disturbing thing about UFO sightings from South America is the frequency with which they are accompanied by reports of strange creatures in the same area. In some cases animals are also found dead in the vicinity of reported UFO sightings, after suffering what is now widely known as a Chupacabre attack. Are Chupacabre flying the UFOs? Are aliens visiting the Earth to drink the blood of our livestock? It's a chilling thought. While most of these creature attacks occur in rural areas it would seem that even the city streets are not safe as this tale from Varginha, Brazil demonstrates. On the night of Friday 16 January, 1996 a satellite picked up a large UFO heading towards the small industrial city of Varginha in central Brazil. The Brazilian Air-force are famous for taking the UFO phenomenon very seriously and in this case scrambled fighter jets to intercept the object. The local military was placed on high alert, anticipating the chaos that was about to erupt. A media blackout was enforced in Varginha but that did not stop countless residents witnessing the strange lights in the sky. Some had video cameras and recorded what appear to be white object drifting through the streets. One resident said that one of the UFOs was as big as a minibus and 'almost transparent'. Others described visibly solid objects passing right in front of their houses. 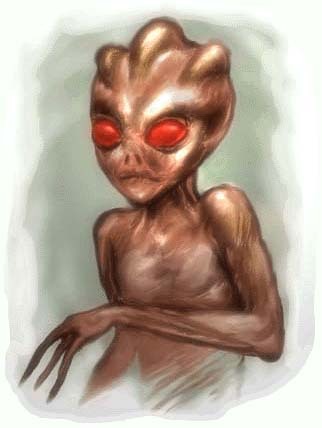 But the disturbing thing about the Varginha story is that the drama did not stop with the UFOs. By the following morning a new panic was beginning to grip the city; residents had reported seeing strange creatures wandering the streets. The most prominent sighting was made by two young girls who ran home claiming to have seen the devil. They described a short demon-like creature with red eyes and three horns on it's head. They also said that it seemed to be in pain and smelled terribly of urine. Earlier that day, the police and fire department had been called to the scene of another sighting where they apparently shot and captured a dwarf-like creature. The creature was seen being taken away in a sack. It's an incredible story and to top it all off, one of the soldiers involved in the capture of the creatures died several weeks later of an unidentifiable bacterial infection. Coincidence? Perhaps not. Perhaps he contracted whatever illness the creatures themselves were suffering from, or perhaps the ammonia smell the creatures secreted was actually evidence of a chemical defence mechanism. In 1954 a string of bizarre attacks took place across northern Venezuela, the assailants: hairy alien dwarves. In the early hours of November 28, Gustavo Gonzalez and Jose Ponce were driving along a lonely road near the Venezuelan capital, Caracas, when they encountered a small glowing orb hovering in the middle of the road. Getting out of the car to investigate (which is never advisable) Gonzalez was pushed to the ground and set upon by a dwarf-like creature. Gonzalez pulled a knife and lashed out at the creature but later said that it had simply bounced off the creatures skin without causing any harm. Three more creatures arrived on the scene carrying rocks and so Jose Ponce jumped out of the van to help in the fight. At this the three creatures fled into their glowing space ship and flew away. As luck would have it a doctor had witnessed the scuffle from a distance and rushed to the scene, treating Gonzalez injuries. On December 10 that same year, two hunters encountered the same four dwarf-like creatures and their hovering mini-UFO near Carora. One of the hunters struck an attacking dwarf with the barrel of his gun but the gun simply snapped in two. They headed straight for the nearest police station to report the incident, their skin scratched and bruised and their clothes ripped to shreds. The third incident took place one week later near the town of San Carlos del Zulia. Jusus Paz was urinating at the side of the road when he was set upon by the gang. He suffered serious lacerations. As he lay bleeding in a pool of his own fluids he looked up to see the small UFO heading off into the night sky. In 1967, ranch worker Inacio de Souza spotted three 'beings' apparently 'playing' on the landing strip of a ranch near Pilar de Goaias. At first he thought they were children but thought it odd that they were wearing skin tight clothes. When a UFO arrived on the scene and hovered over the beings he realized that they were not children at all. He fired his rifle at the trespassers, eliciting an equally violent response from the UFO. A green light knocked the ranch-hand to the ground, allowing the aliens to board their ship and escape. The story does not end there. Over the next few days Inacio de Souza experienced extreme nausea and headaches. It became apparent that he had also suffered burns to his head and upper body, which were apparent as circles on his skin. The ranch owner took him to a doctor who determined that he was in the final stages of leukaemia. De Souza died roughly two months after his alien encounter, apparently the victim of a malicious and slow acting alien weapon. His body was covered in strange yellow and white blotches. During 1977 the Brazilian island of Colares was literally besieged by UFOs. Panic gripped the area as the unidentified craft began attacking the civilian population, firing what have been described as laser beams and causing serious physical injuries. Over 80 people reported having been attacked, at least 35 of whom suffered symptoms akin to radiation sickness (nausea, fatigue, headaches etc.). Burn marks were also visible on their bodies with small central puncture wounds and permanent hair loss occurred around the affected area. Two of Colares residents are thought to have died as a direct result of these attacks. The Brazilian Air-force responded to the attacks in Colares by sending a team to the island to investigate. The 'Operation Saucer' team took photographs of the UFOs, recorded their trajectories and interviewed witnesses over a period of four months during which the attacks continued. Some of the results of this investigation were made public in 2004 but the events of 1977 still cannot be conclusively explained, with some materials still being held by the Brazilian Air-force. However, the official reports do tell us one interesting fact that the UFOs routinely arrived from the north, sometimes travelling by air and sometimes underwater. 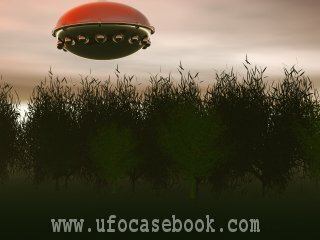 The Colares UFO flap is one of the most famous UFO cases from South America and, interestingly, it can also be linked to other sightings, even to the Chupacabre. Victims reported that when they were targeted by the UFOs they became paralysed, held in a powerful shaft of light. Some also reported that they felt as though their blood was being sucked out by the light beams, earning the UFOs the name 'chupa-chupa' – literally 'sucker-sucker'.